Why the name change to Coloredsand.com? 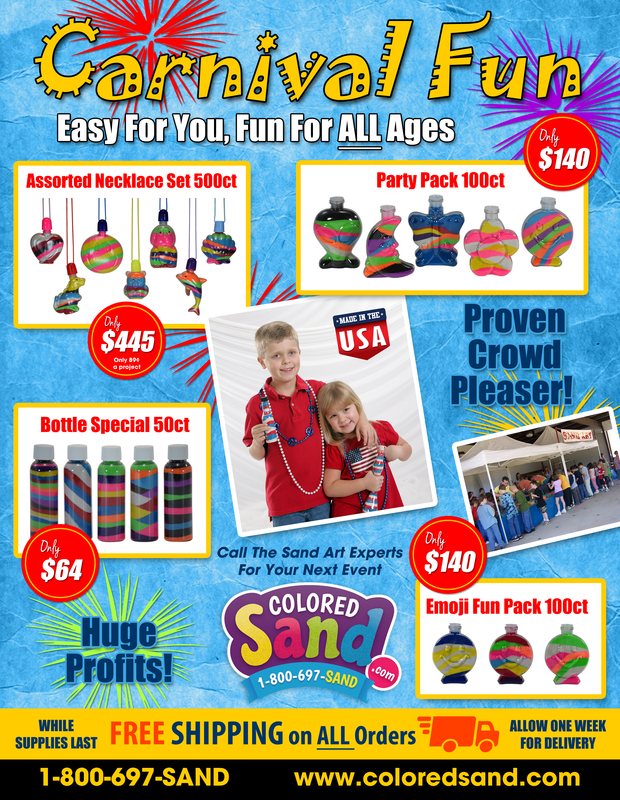 $25.00, we have the lowest minimum in the sand art industry. What will be the shipping cost for my order? FREE! We have FREE SHIPPING for our continental US customers! Check out our page on shipping. Yes, but the order has to be called in. UPS offers Next Day & 2nd Day Air which would require an additional fee . Orders have to be received by 2:00 pm for same day shipping. A $15.00 rush charge applies. We ship all orders out of our warehouse within 24-48 hrs. View our Shipping Page for UPS time in Transit. Yes, we do allow pickups. The order will be treated as a mail order sale. The order must be called in, and a credit card will be needed. We are a warehouse and not a store location, so our associates would need to know the exact day and time you would like to pick up. Each order is custom built, so we need 24 hrs. notice. Unfortunately, No, a new order would need to be placed. Once your order has shipped, we email you the tracking numbers for your shipment. You can track them at www.ups.com or www.usps.com , you can also call our Shipping Department and they will be happy to track your order for you. Because of extreme shipping charges, we do not ship overseas unless your order will be over 2000.00 USD worth of product. We mainly ship to the United States, Canada, Puerto Rico. Are your products in stock and ready to ship? Yes, Coloredsand.com takes great pride in keeping everything in stock and ready to go. Yes, we will ship to P.O. Boxes, but the majority of orders are shipped UPS Ground. Call for a return authorization number. Returns must be made within 30 days. A 15% restocking fee will be applied. For details, check out our Shipping page. Where can I download your sales literature, instructions and prices? What age is appropriate for Sand Art? Ages 3 - 103 LOVE Sand Art. Not appropriate for children under 3 because of small parts. Is the colored sand Child Safe? 100% YES, Our colored sand Conforms to ASTMD4236-88 The sand is non-toxic, non fading. As good as the sand looks, please do not eat it. Sand is Fat Free, but not very tasty! What colors of sand do you carry? We carry 18 colors: red, pink, purple, orange, green, lime, black, white, brown, blue, violet, coral, teal, yellow, sky blue, beige, grey, burgundy and a beach sand. Guaranteed Brightest Colors in the WORLD! Do your Sand Colors Fade? No, our colored sand is non-fading. Top 10 Colors of Sand? Red, pink, purple, orange, lime, black, white, blue, yellow, green. Whenever we send out large packages or Starter Kits, these are the top 10 colors that are included. There are 16 ounces in a lb. How many lbs of sand are in a Gallon? 16 lbs of sand are in a gallon. How much Sand will I need? How much sand you need for your Sand Art project depends on many things. #1 - What kind of bottle are you filling? #2 How many do you want to fill up. Example: Our Baseball Bottle is an 8 oz. bottle. This is 8 fluid oz, so to figure the sand amount, the best way is to double it. Sand settles and packs, so the baseball would take 16 oz. of sand. (1 lb) this allows for a little spillage. For 20 baseball bottles you would need 20 lbs. Yes, we have quantity discounts that apply for everyone. The more you buy, the cheaper the price gets. On the bottles we have quantity discounts at 72 or more, 144 or more, and 500 or more. Call for larger quantities. Do you have instructions for the Sand Art? 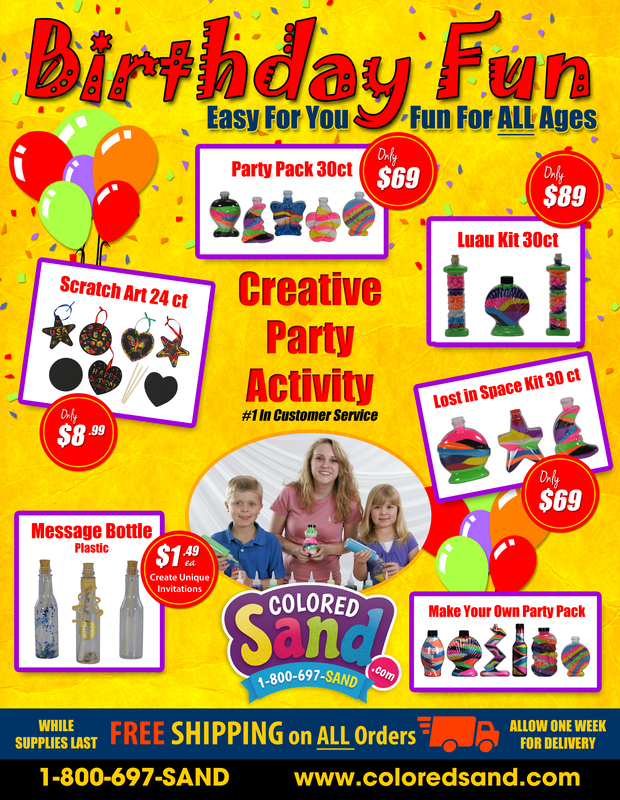 With every sand art order, we provide you with easy, step by step instructions. Can Sand Art be done inside? Yes, we have libraries, schools, churches, etc. that have done Sand Art inside. This activity can be done inside or out. Sand Art is cleaned up easier than cake and ice cream. How many Sand Arts should I buy for my School Carnival? Schools on average do about 50% of the school population. For example: If 600 children attend the school, 300 Sand Arts would be a good starting point. Smaller schools normally have a higher turn out. Our associates always tell you, for the first year get the amount that makes you feel comfortable. If you sell out, you'll know to get more next time. Does the sand turn bad after time? NO, the Sand never goes bad. Just keep it dry. Do boys & girls like Sand Art? YES, definitely! We sell to boy scouts, girl scouts, baseball teams, colleges, preschools, retirement homes, amusement parks, etc. EVERYONE enjoys creating Sand Art. Young, Old, Male or Female! Are the Message Bottles Plastic or Glass? We have both, plastic and glass message bottles. How tall are the bottles? The bottles are 6 1/2" tall, the cork sticks up a little higher. What is the opening size of the message Bottle? The opening at the top of each message in a bottle is 1/2" across. Are the plastic bottles as nice as the glass? YES, the plastic is identical to the glass bottle. Many people prefer the plastic bottles because they are cheaper to ship and they will not break. Can the Message Bottles be mailed? YES! If you are using the Glass message bottles, you have to use a box. The plastic message bottles can be mailed as is, with a label and postage right on the bottle. How much postage does it take to mail the Message Bottles? Postage depends on your final project. The US Postal service is constantly changing the rates, so take 1 completed project to your local Post office to get rates. The Plastic message bottles are about ½ the cost . Do I need a box? Only if you are mailing out the Glass Message Bottles. Some people like to tie ribbons around the neck of the bottle or enclose maps or response cards. If this is the case a box will be needed. What size paper fits in the Message Bottles? A good size is 5"x7", You can also take a regular sheet of paper (8 ½ x 11) and cut it in half. The bottle is 6 ½" tall, but the cork sticks down in the bottle a little. When rolled up your paper should be approx. 6" or less. No, we only sell the supplies for you to make your own Message Bottles. What Occasions can you use Message in the Bottles? What accessories do you carry for the Message bottles? We carry the bottles, mailing boxes, sand, shells, umbrellas, sealing tape, raffia & confetti. Check out our Online store. How do I seal the corks for mailings? The corks will stay in. One decorative way is to secure the cork with colored tape. We carry red, blue, white, yellow, and green. How much sand do I need for my Message Bottles? Filling the bottle about 1/2" with sand, you can get approximately 20 message bottles per pound. Do you mail samples of the Message Bottles? We have a Sample Pack available. It is $10.00 and includes samples of the following; a glass and plastic message bottle with corks, a mailing box, sand and shell samples, a piece of the raffia, and a price sheet. The $10.00 price includes Priority Mailing. How many bottles does the bag of shells cover? The bag of shells will do approximately 50 bottles. Are there Quantity discounts on the Message Bottles? Yes, there is a quantity discount given at 72 or more, 144 or more, & 500 or more.